At the time I bought this single, the forthcoming demise of the 7" vinyl single format as a commercial item in Europe was getting more obvious by the week. Although 7" singles were still being made in the UK, European pressings became increasingly rare. At the time of buying this single, I was buying every track I liked on this format on principle. 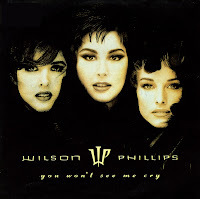 'You won't see me cry' was actually the first Wilson Phillips track I liked - all their previous singles were dull and uninteresting to me. It wasn't a hit in the Netherlands, but it peaked at number 18 in the UK singles chart.